The "plugged" burrow opening entrance is located at the perimeter edge of the mound's footprint. Yard Gard Multi-Animal Repellent is designed to deter a variety of animals that forage for grubs, insects, and other underground food. These animals have a keen sense of smell and we use their senses against them by creating a barrier in the soil that sends them away. Our all natural repellent is made from all natural, organic ingredients so that your family and pets are safe. 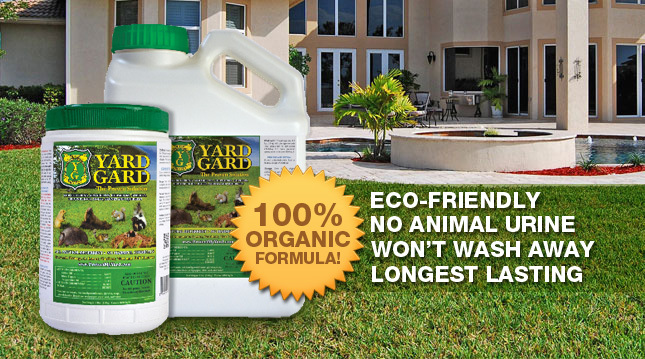 Yard Gard Multi-Animal Repellent removes digging critters from your yard safely and effectively without harmful man-made chemicals. See more general information on gophers below. If you need any additonal assistance don't hesitate to call our experts at 1-855-665-3746. Like all ground burrowing animals, the gopher must be conditioned (trained) to know that the Yard Gard treated area is unfriendly to his senses (sense of smell and sense of taste). This often takes time as we learned in our testing process. Below you will find the results of our test data on a golf course fairway. The "red-lined boxes" shown below represent the area of the golf course treated with Yard Yard Animal Deterrent. 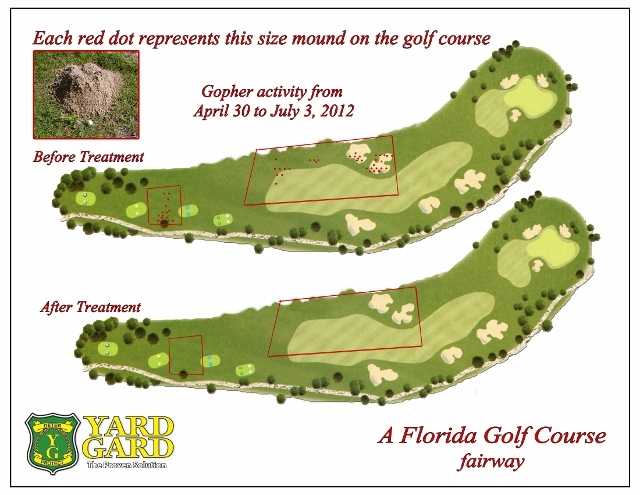 the bottom "lay-out diagram" represent the area after treatment with Yard Gard. 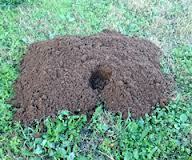 See the photo insert below of the gopher mound with a golf ball at the base of the mound to depict the size of the mound. After application of Yard Gard product, the gophers started leaving the area. See the "red-lined boxes" pictured below. The gophers moved out of the treated area for good. Observe the "red dots ( . )" Each red dot ( . ) represents a gopher mound). Two months time period laps from data in the top layout diagram (Before Treatment) verses data in the bottom layout diagram (After Treatment). The gopher activity and mounds was disappeared over the total time period. Notice in the bottom course lay out diagram (After Treatment), the "red dots" are gone. After two month: No more gopher mounds.